Brett Friedman receives The Billy George USLA National Sportsmanship Award. This award is presented to the individual, who in the opinion of the Officials, displayed the best sportsmanship at the USLA National Championships. 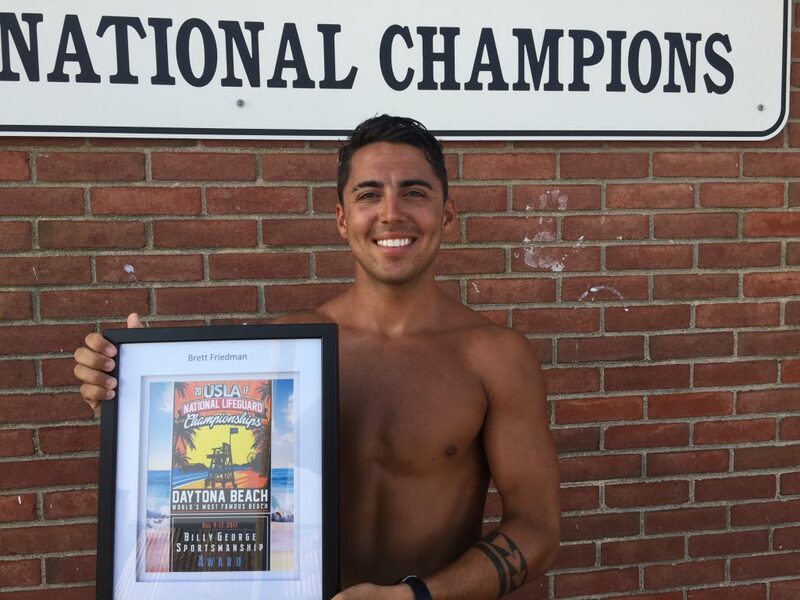 During the USLA National Championship in Daytona, Florida on Thursday, beach flags preliminaries were in full swing. Brett Friedman (Class of 2015), just like any other competitor, was trying to secure his spot in the final heat of twelve men on Friday night. He made the final heat! As soon as the Open Men Beach Flags were concluded, Lifeguard Friedman stayed back and helped USLA officials with all of the Open Women Beach Flags’ heats, as well as all of the age categories. The hot, hazy and humid conditions were tough to handle, especially if you were 50 yards away from the Ocean and closer to the boardwalk, where the temperature was close to 100 degrees Fahrenheit. Lifeguard Brett Friedman, during his three years as a S.P. Lifeguard, helped to maintain the outstanding record of “0” drownings. Apart from that, Brett has helped the Smith Point team regain the Open Men Beach Flag Championship title this year. The Billy George USLA National Sportsmanship Award was presented to Brett at the conclusion of the tournament. Brett Friedman won the hearts of the Officials, where he displayed the best sportsmanship at the USLA National Championships. Congratulation Friedman!! !